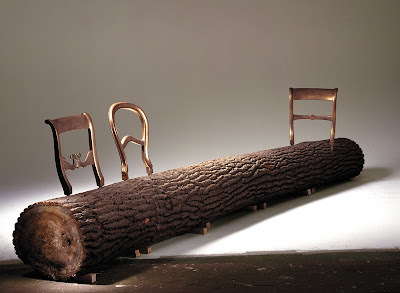 In a break from my usual Guess How Much format, I leave it completely up to you, the savvy shopper, to guess just how much for the "Tree Trunk Bench." Click Read More for the answer and brace for impact. Whatever you guessed, you weren't even close. A fallen tree can serve as a seat. The addition of bronze classical chair backs makes it a proper piece of furniture, a crossing between nature and culture. Jurgen Bey makes clear that it is ridiculous to transport trees when they are locally available. Therefore only the chair backs are for sale. Material: Bronze. That's right. 15 grand for three metal chairbacks. And you still have to go out and chop down some poor unsuspecting tree. Don't believe me? Go here. Tis The Season... To Be Farting? I've Fallen and I Don't Know What Day It Is! Fiber Optic Fridays: Good Gourd!